We added another Bulldog to the family! 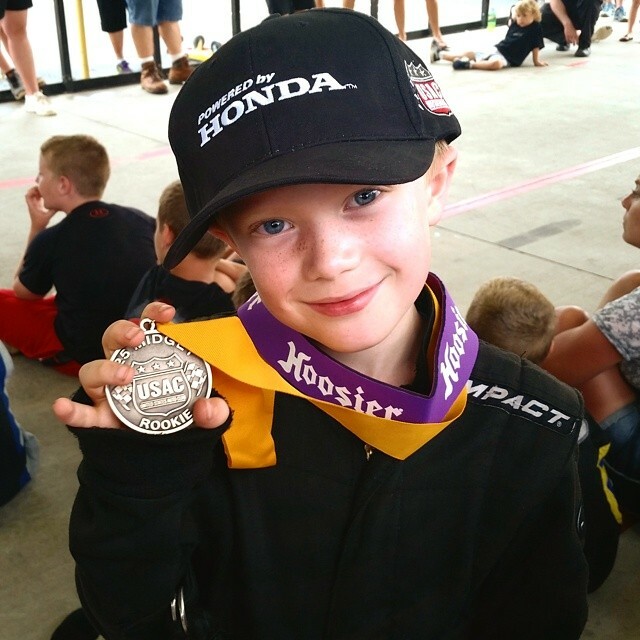 Dillon will be racing 2 cars when he moves up to the competitive classes! What a beautiful weekend it was to be outside at the racetrack! Dillon loved getting to see all his NCQMA buddies again and Caroline is already hanging out with the girls (picture of that coming soon)! 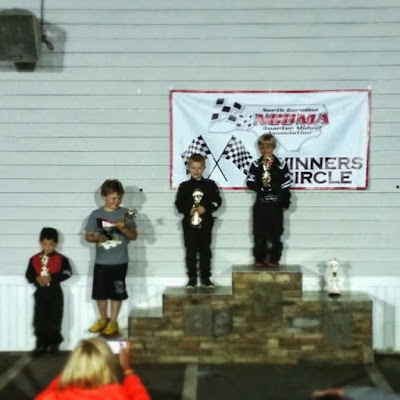 Dillon started and finished 7th in the fun run race but everyone got a trophy, so he was very excited about that! We had a wonderful weekend at the track! 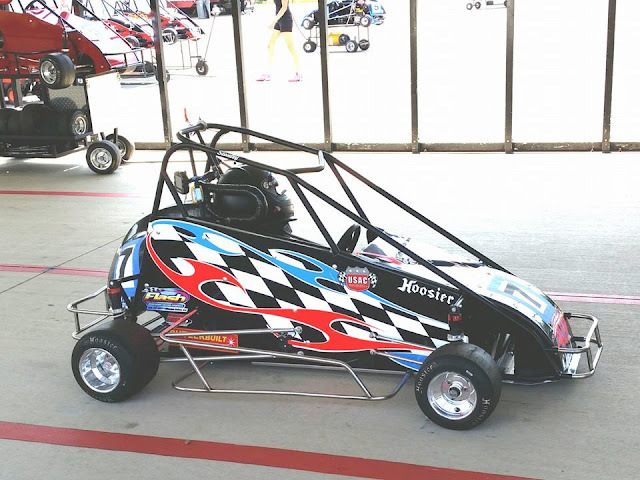 Dillon started 3rd in his heat race, lost a position on the start, but then was able to pass back up to finish 3rd. The 3 heat races were combined into 2 feature races, so Dillon started 4th in the feature. He fell back to 7th after the start, but then passed 2 cars to finish in the 5th position. It seems strange to be so excited about him finishing further back than where he started, but after weeks and weeks of him letting off the gas whenever he got behind other cars, he finally got to the point that he was racing and hanging in there with everyone else. Now we need to work on passing on the inside, since for some reason he was determined that passing on the outside was the way to go! 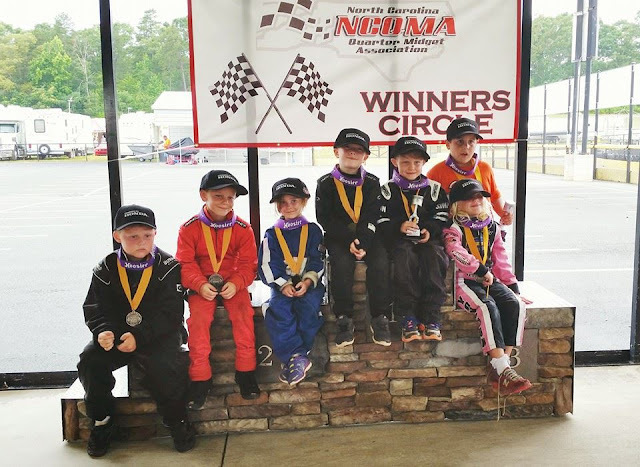 After the races, we had a great time camping at the track and spending the evening around the campfire roasting marshmallows with some of the other NCQMA families. I think all of us are excited and looking forward to the next race! 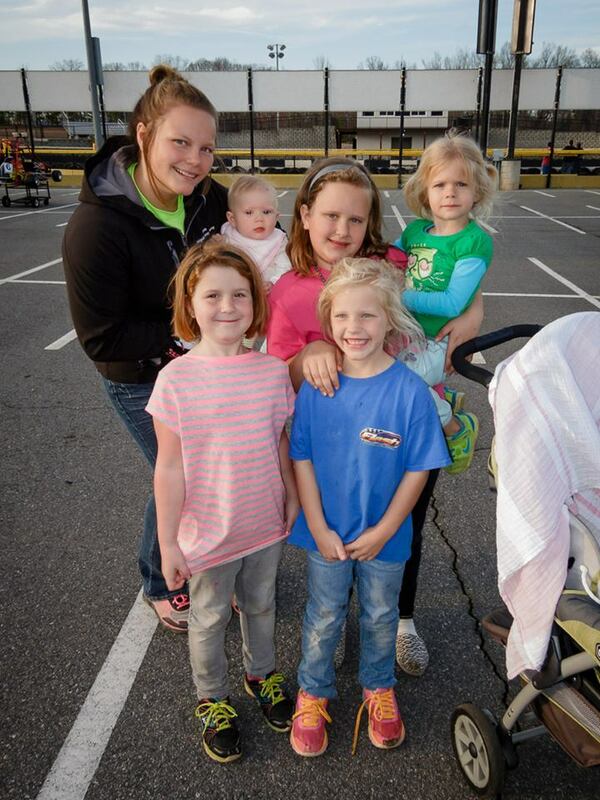 Caroline enjoyed making friends with all the other girls at the track! Dillon did great in his heat race! He was paper #6, but ended up starting 5th. He passed multiple cars, but some were right before cautions, so those didn't count towards his passing points. He did have 2 official passes to finish 3rd! We are so proud of his improvement! Dillon did great in his race and finished 2nd! We're looking forward to him finally making it onto the podium for the trophy presentation. Second place finish to end he month! Great job, Dillon! Dillon started 3rd in his heat race, was involved in a wreck while passing for the lead, and had to go to the back of the field for the restart. Then he was involved in another wreck while passing for 3rd, and had to restart in the back again. Unfortunately, after that there just weren't enough laps to be able to do much, so he finished 4th. He will most likely start the feature race in 4th. The day didn't end the way we had hoped. Dillon was involved in a crash that sent him into the outside wall and he was unable to finish the race, bringing home a 7th place finish. Dillon is fine and is off playing in the dirt with his racetrack friends now. Dillon finished 4th in his race, but caught another car as he was exiting the track and went airborne. He flipped the car a couple of times and slid down the back stretch with the car upside down. The announcer was quite impressed... Dillon is fine but the top of the car has some nice scrapes and Ron has to replace a few rods to get everything ready for the feature race tomorrow. We have also decided Dillon is now ready for all the roller coasters at Carowinds! Dillon finished 4th in the feature race. All the rookies on the podium.